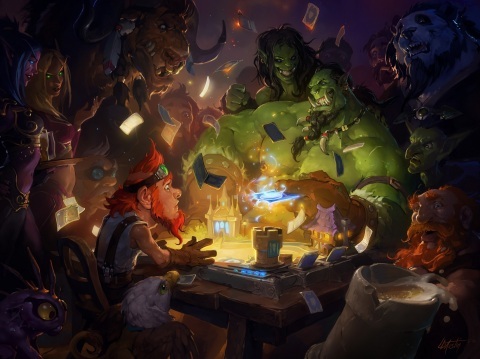 Hearthstone® Welcomes 100 Million Players to the Virtual Tavern | Activision Blizzard, Inc.
Hearthstone features a deceptively simple format in which players build digital card decks and duel each other head-to-head or play through one of several different card-based Solo Adventures. As a result of its charm and accessibility—as well as the corresponding entertainment and education provided by numerous talented community content creators—Hearthstone has consistently been a leading game on media platforms like Twitch and YouTube. As a card-based game, Hearthstone is unlike any of the other games regularly in the top ranks on those platforms. In addition to its highly accessible card-vs.-card gameplay and the colorful personality that comes through its vibrant audio and visual elements, a major difference is that all player-to-player communication takes place through pre-generated voice lines tailored for each of the game’s playable heroes—all conveying warmth, positivity, and good-natured sportsmanship. This helps create a welcoming setting for all players, from beginners to seasoned veterans, and despite being a skill-based competitive experience, offers a change of pace from other competitive games. In addition, Blizzard recently overhauled the “new-player experience” for the game, putting a bigger buffer between beginners and veterans—making it even easier for anyone to jump in and play. One of the company’s core design principles has been, “Easy to learn, hard to master,” and Hearthstone is a shining example, with an introductory competitive experience that eases players into the fundamentals of the game and amply rewards them along the way. At these events, players hang out, enjoy the atmosphere and establishment, and battle each other on their mobile devices in a casual competition. Special prizes are often awarded, and friendships often develop. Another highlight is that Fireside Gatherings often feature pre-release parties for upcoming Hearthstone content expansions, giving attendees a first crack at playing the newest cards being added to the game. This year alone, more than 23,000 Fireside Gatherings have taken place,† with many more scheduled in cities everywhere. With more than 100 million players worldwide, Hearthstone® is Blizzard Entertainment’s internationally acclaimed free-to-play digital card game designed for novice and veteran card-slingers alike. Players can choose from nine powerful hero classes and customize their decks with minions, spells, and weapons based on the unique fantasy of the Warcraft universe. Featuring a variety of game modes ranging from epic head-to-head duels to story-driven Solo Adventures, Hearthstone offers a vibrant and rewarding experience stacked with strategy, personality, and fun. Hearthstone is available globally for Windows and Mac PCs; Windows, iOS, and Android tablets; and mobile phones. Learn more at www.playhearthstone.com. Best known for blockbuster hits including World of Warcraft®, Hearthstone®, Overwatch®, the Warcraft®, StarCraft®, and Diablo® franchises, and the multifranchise Heroes of the Storm®,Blizzard Entertainment, Inc. (www.blizzard.com), a division of Activision Blizzard (NASDAQ: ATVI), is a premier developer and publisher of entertainment software renowned for creating some of the industry’s most critically acclaimed games. Blizzard Entertainment’s track record includes twenty-two #1 games* and multiple Game of the Year awards. The company’s online-gaming service, Blizzard Battle.net®, is one of the largest in the world, with millions of active players. †Based on internal company records. *Sales and/or downloads; based on internal company records and reports from key distribution partners. Information in this press release that involves Blizzard Entertainment's expectations, plans, intentions or strategies regarding the future, including statements about dates, content, and rewards of the 100 Million Players Celebration event for Hearthstone are forward-looking statements that are not facts and involve a number of risks and uncertainties. Factors that could cause Blizzard Entertainment’s actual future results to differ materially from those expressed in the forward-looking statements set forth in this release include unanticipated product delays and other factors identified in the risk factors sections of Activision Blizzard’s most recent annual report on Form 10-K and any subsequent quarterly reports on Form 10-Q. The forward-looking statements in this release are based upon information available to Blizzard Entertainment and Activision Blizzard as of the date of this release, and neither Blizzard Entertainment nor Activision Blizzard assumes any obligation to update any such forward-looking statements. Forward-looking statements believed to be true when made may ultimately prove to be incorrect. These statements are not guarantees of the future performance of Blizzard Entertainment or Activision Blizzard and are subject to risks, uncertainties and other factors, some of which are beyond its control and may cause actual results to differ materially from current expectations.